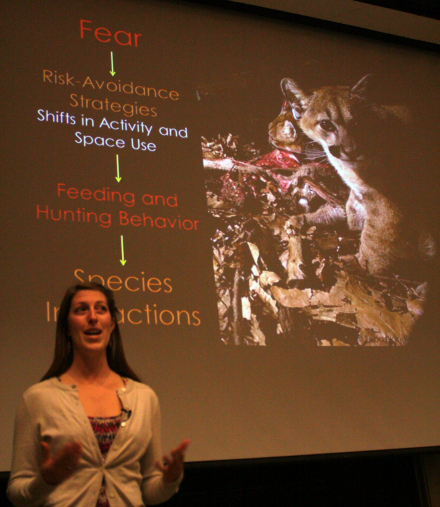 Doctoral candidate Justine Smith won the 2015 Grad Slam with her presentation of research with pumas in the Santa Cruz Mountains. Sponsored by the Graduate Division, the Grad Slam challenges students to deliver short, engaging presentations geared toward a lay audience. Participants were selected based on video submissions screened by a team of volunteer judges from across campus. On April 6, a panel of judges will choose the first-place winner, who will receive a $3,000 award, and a runner-up, who will receive $1,500; the audience will vote for a People's Choice award recipient, who will receive $750. The event, which is free and open to the public, begins at 5:30 p.m. in the Music Center Recital Hall. The campus winner will compete in the UC-wide Grad Slam in San Francisco on April 22.